"Of course, representing our school, veritas is our motto name at Harvard." According to Guitar-Rigs.com, Hammet used the Trem-O-Verb combo. To the left of Ed you can see his two Mesa Boogie Trem-O-Verbs. You can also find these amps on "The King Of Gear:" "Ed has used two of these Mesa Boogie combos since before Pablo Honey. 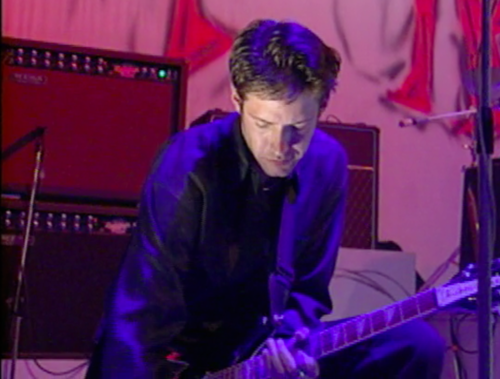 Ed’s two originals, used on Pablo Honey and The Bends, were stolen in 1995, but he quickly purchased two new ones. Those two were used until 2009. Originally, Ed would set one of the amps to heavy distortion, and the other quite clean, using a Boss LS2 to switch between them. On Creep, he used the a tremolo pedal with the clean amp for the verses, then switched to the tremolo-less distorted amp for the choruses. Ed currently owns two, “both from 1995-6, they are slightly different but both run with standard Boogie 6L6 / ECC83’s.” Mic’d with a Shure SM57 until circa 2006, then with a Sennheiser 609. For reference, Ed’s Mesas will be designated as such: Mesa Boogie Dual Rectifier Trem-O-Verb No1 Clean 1992-1995 Mesa Boogie Dual Rectifier Trem-O-Verb No2 Distortion 1992-1995 Mesa Boogie Dual Rectifier Trem-O-Verb No3 Clean 1995-2009 Mesa Boogie Dual Rectifier Trem-O-Verb No4 Distortion 1995-2009"
In an interview with Premier Guitar (2012), Kim Thayil stated, "When I got there, Matt brought a Mesa/Boogie Tremoverb combo and Neil had one, too. I just really liked how it sounded and it felt almost instantly like Soundgarden." "Elbow's guitarist Mark Potter has been a Boogie enthusiast for many years starting with a Tremoverb combo he faithfully used through many of the bands earlier albums like *Asleep in the Back* and *Cast of Thousands*." His technician interview and photos. I have owned the Tremoverb for 4 years now and I use it at every gig I play. The tone of Mesa amps in general is amazing but I deem this a cut above the rest. It features 4 modes on 2 channels with the ability to channel clone which makes the Tremoverb a very versatile amp. If you're lucky enough to be able to turn it up at a gig, watch out. This thing is the Big Bad Wolf: it'll blow your house down. The tone is unreal. Although the distortion is brutal (in a good way) your notes won't get lost in a soup of sound. It takes pedals well which is a must for me. This also helps me play at lower volumes with the aid of some distortion pedals. The biggest drawback is how heavy it is. It is built like a tank and I'm never worried about it but if I have to move it by myself it isn't that fun. It does sport 4 rugged casters on the bottom so you don't have to carry it everywhere. I have owned several amps over the years but I have never owned anything better than the Mesa Tremoverb. This amp has been used by my heroes, especially my biggest one, Mike Einziger of Incubus, of whom inspires me. I had to get this amp not only because I love his tone and style, but because it can do that and MUCH, MUCH more!! It serves as my main dirty amp! The only downside is that the one I purchased has required some maintenance, but other than that, I absolutely love it! It and the Road King II are my favorite amps! !